Kid-friendly rides: The Tower of Terror might sound fun to you but we bet your children won’t be so happy on it! Opt for children-specific rides like Dreamworld’s friendly River Rapids, Kung Fu Panda’s ‘Land of Awesomeness’ with bumper cars and the Wiggle’s rides like the Big Red Car Ride. 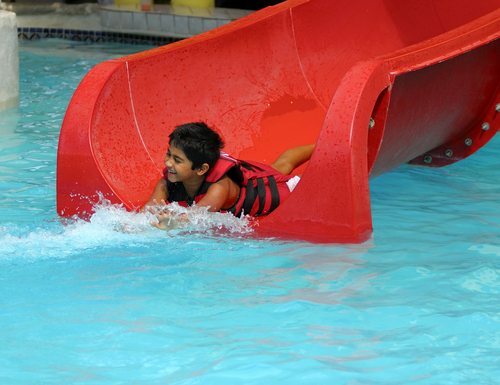 WhiteWater World has the child-friendly Wiggle Bay that is shallow with a lifeguard on duty, as well as a water playground with slides, water guns and more. Nearly all theme parks have areas for smaller children. Pre-purchase your tickets: If you get to the gates of your preferred theme park after 10:30 there will be queues to get in, so pre-purchased tickets save time and keep the kids from getting upset. It can also give you a headstart on the rides before they start filling up. Alternatively, you could book an Early Entry Ticket to Dreamworld, which allows you to get an hour head start on the crowds at 9am. Eat healthy: Theme park food is becoming more diverse, but a lot of it is still on the unhealthier side. Try for the better options to avoid grumpy, bloated or sugar-crashing kids, or bring a picnic if you’re visiting WhiteWater World. You can bring an esky, pick a table under the shade cloths and take healthy food and drink breaks in between the rides. Slip, slop, slap: While Queensland is well known for its sunshine, a whole day out in it can lead to sunburn or even sunstroke. Stick to the Cancer Council’s tenants of slip on a T-shirt, slop on some sunscreen, slap on a hat, seek shade and slide on some sunglasses for you and the kids. For rides that will keep you cool, head to Dreamworld’s IMAX theatre, choose a wet ride like the log rides or simply splash around in the pools at WhiteWater World. If you’d prefer to avoid the midday heat completely, head into the parks at night with Dreamworld’s After Dark Park Screamworld and WhiteWater World’s night sessions that start at 6:30pm on specific days. You get 3.5 hours of fun with no harsh sun to worry about!